BELIZE CITY, BELIZE, MONDAY, 1 October 2018 (CRFM)—The state of the Eastern Caribbean flyingfish, as well as an updated plan to improve the management of this valuable resource shared across many Eastern Caribbean States, will be discussed at a two-day meeting being convened in Barbados today, Monday, 1 October 2018. The discussions will take place in the context of the Special Meeting of the Joint Working Group on Flyingfish in the Eastern Caribbean, constituted by the Caribbean Regional Fisheries Mechanism (CRFM) and the Western Central Atlantic Fishery Commission (WECAFC) of the Food and Agriculture Organization (FAO). Chief Fisheries Officers, as well as representatives of fisherfolk organizations, the Organisation of Eastern Caribbean States (OECS) Commission, and development partners such as FAO-WECAFC, the University of the West Indies (UWI), the Caribbean Natural Resources Institute (CANARI), and the French Marine Research Agency – IFREMER, are due to attend the meeting, being held at the Blue Horizon Hotel in Christ Church, Barbados. “This meeting of the Joint CRFM/WECAFC Working Group on Flyingfish is timely and important given the challenges we face in the region from climate related changes affecting the marine environment and flyingfish stocks, and ultimately the livelihoods and food security of thousands of persons engaged along the entire flyingfish value chain,” said Milton Haughton, Executive Director of the CRFM. “Our objective is to use the best available information and international best practices to make and implement reforms, and to work together to address the challenges and ensure sustainable and profitable fisheries now and in future,” Haughton added. 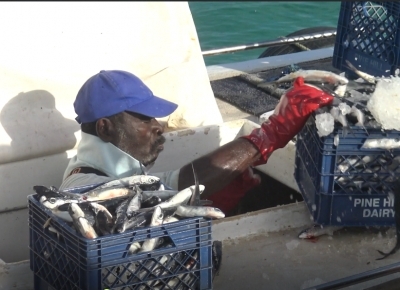 The stakeholders have been engaged in a series of consultations and technical studies towards strengthening governance arrangements, such as updating the Eastern Caribbean Flyingfish Fishery Management Plan (FMP), which was adopted in 2014, as well as developing a policy for the sharing of data and information among the countries involved in the fisheries. The updated FMP is intended to improve the efficiency and viability of the sector and would also be adaptable to other fisheries. The flyingfish initiative also focuses on improving stakeholder participation in planning and decision-making and improving collaboration between CARICOM States and the French Islands in research and management of the flyingfish fisheries. The Joint CRFM/WECAFC Working Group is expected to produce tangible outputs for consideration by decision-makers at the meetings of the CRFM Ministerial Sub-Committee on Flyingfish as well as the Ministerial Council, both due to be held in early 2019. Six CRFM Member States—Barbados, Dominica, Grenada, St. Lucia, St. Vincent and the Grenadines, and Trinidad and Tobago—are beneficiaries of a series of subprojects for which the CRFM is taking the lead. The CRFM had contracted Blue Earth Consultants, a division of the Eastern Research Group, to lead three of the six flyingfish sub-projects in collaboration with a team of local and international partners. CANARI in Trinidad and Tobago and Nexus Coastal Resource Management (Nexus) in Halifax, Canada, have been leading the remaining three sub-projects. The CRFM, through this initiative, is emphasizing the Ecosystem Approach to Fisheries (EAF) for the management of the flyingfish Fishery, in a consultative approach that involves the full range of stakeholders. Th Initiative is supported with funding provided by the UNDP/GEF CLME+ Project which is working to achieve a healthy marine environment supporting enhanced livelihoods of the people of the Wider Caribbean. A 16-minute documentary on the Eastern Caribbean flyingfish fisheries has also been produced as a part of the initiative. The first Sub-Regional Fisheries Management Plan for Flyingfish in the Eastern Caribbean was formally approved by the CRFM Ministerial Council in May 2014 and is now cleared for implementation by CRFM Member States. A consultative process will facilitate stakeholder involvement in all stages of implementation. The Sub-regional FMP was prepared through a consultative processes that included stakeholders at national and regional levels including public hearings, national and regional workshops and reviews by national Fisheries Advisory Committees (FACs). Strengthen current national data collection systems to facilitate improved assessment and management of the resource as well as monitoring and evaluation of implementation of national and sub-regional fisheries management plans. promotion of the principles and provisions enshrined in fisheries and related regional and international agreements to which countries are signatory. This management approach demonstrates the commitment of the CRFM and the Eastern Caribbean sub-region towards the conservation of their common or shared fisheries resources and related ecosystems for the long term sustainability of the resources and socio-economic benefit of the people of the region. This updated Sub-regional FMP further proposes a number of studies, which aim to: (i) generate information about the flyingfish industry that is needed to attract investments in sustainable harvesting and value-addition of flyingfish; (ii) further understand the health of the marine ecosystem, which supports the flyingfish fishery; and (iii) facilitate development of operational objectives, indicators and reference points, in consultation with stakeholders, so as to effectively monitor and evaluate implementation of the FMP at the national and regional levels, according to the agreed management priorities. A copy of the Sub-Regional FMP may be downloaded by clicking the link highlighted above. This database is envisioned as a component of a broader regional database pertaining to shared fisheries resources in the region. This database is envisioned along similar lines as above. BELIZE CITY, BELIZE, MAY 24 (CRFM)--A historic Flying Fish Fisheries Policy has been endorsed by the Caribbean Regional Fisheries Mechanism’s (CRFM) Ministerial Council. 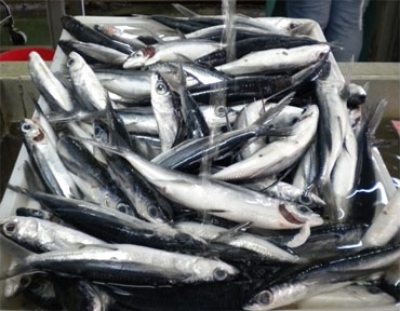 The Sub-Regional Fishery Management Plan for the Eastern Caribbean Flying Fish Fishery was approved at the council’s just concluded eighth meeting held at the Fort Young Hotel in Roseau, Dominica. 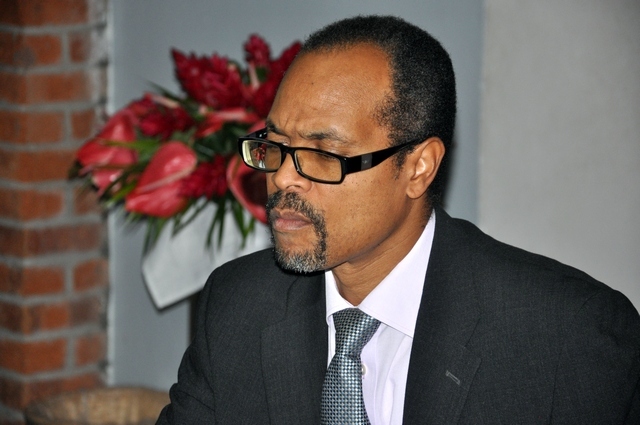 The CRFM’s Executive Director Milton Haughton (photo below) says it is the first time the Caribbean has approved a joint management plan for the shared resource. “This is a significant development because this is the way we need to go in order to strengthen the governance arrangements for the shared resources, so this is a first step,” he said. Haughton says the plan is necessary for the entire region but particularly Barbados, Trinidad and Tobago, Grenada, St. Vincent, St. Lucia and Dominica, which depend on the marine resource. “Flying fish is shared by these countries. Six CARICOM states, plus the French Department of Martinique, exploit the flying fish at this time. These countries need to come together and together decide on the measures that they would put in place to ensure sustainable utilization, proper management and conservation of this fishery,” he added. Haughton said this is important so that fishermen can have decent livelihoods, and ensure optimum production for food security and external trade. 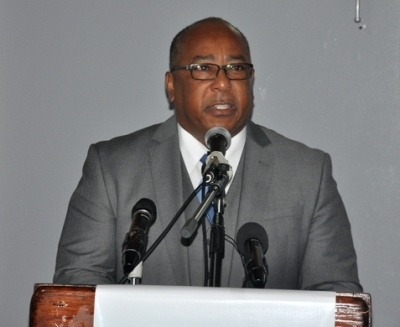 Meanwhile, immediate past chairman of the Ministerial Council, Barbados’ Minister of Agriculture, Dr. David Estwick, says a pending fishing agreement between Barbados and Trinidad is being considered by the Barbados’ Ministry of Foreign Affairs. He explained that because it is a foreign trade issue, the agreement does not lie with his ministry. “I believe very strongly that the interaction of the various ministers of fisheries [should] allow, therefore, a portal through which you can get into the cabinet and get up to the Prime Ministers, but that is not the way it is structured,” he said. Haughton says that with the Sub-Regional Fishery Management Plan for the Eastern Caribbean Flying Fish Fishery now endorsed at the council level, the next step is implementation. The management plan for the flying fish was prepared with the assistance of FAO/WECAFC, the CLME Project and CERMES-UWI. Past and Current Methods of Community-based Coastal Resource Management in Southern Belize by Joseph O. Palacio. Options for Institutional Rationalization of Coastal Zone Management in Belize. Report of the 2000 Caribbean Pelagic and Reef Fisheries Assessment and Management Workshop, 5 - 7 June 2000, Barbados. Establishment of Data Acquisition and Monitoring Systems for the Belize Shrimp Fishery - Description of the Belize Shrimp Fishery. Report of the Conch and Lobster Subproject Specification and Training Workshop (Available in hard copy only). Report of the Joint Meeting of the CFRAMP Shrimp and Groundfish Subproject Specification Workshop and Fourth WECAFC Ad Hoc Shrimp and Groundfish Working Group of the Guiana-Brazil Shelf (Distribution Restricted). Subproject Initiation Mission Report and background Review for Spiny Lobster and Conch. Subproject Initiation Mission Report and Background Review for Shrimp and Groundfish. The Role of Drifting Objects in Pelagics Fisheries in the Southeastern Caribbean. Report of the Joint Mission and Workshops by CFRAMP and Canadian Coast Guard for Small Fishing Vessel Inspection Training. CFRAMP Overview of the Annual ICCAT Meeting for 1992. Report of the Subproject Initiation Mission Report for the Large Pelagic, Reef and Deep Slope Fishes Assessment Subproject (Available in hard copy only). Report of the Subproject Specification Workshop for Data and Information and Licensing and Registration Systems. Report of the Subproject Specification Workshop for National Fishery Management Plans, held in Kingston, Jamaica, 14 - 17 December 1992 (Available in hard copy only). Mission to Explore the Potential for CFRAMP Participation in the activities of the International Commission for Conservation of Atlantic Tunas (ICCAT). Baseline Survey of Fisheries Department in CFRAMP Participating Countries. A Preliminary Assessment of the Conch Fishery on the Shelf and Bank off the South Coast of Jamaica. A CFRAMP Perspective on the Second Billfish Workshop, Southeast Fisheries Center, Miami, Florida, 22 - 29 July 1992. Subproject Initiation Mission Report for Fisheries Data and Information Systems, Licensing and Registration System (WBS 1.1.2 and 1.1.4). Subproject Initiation Mission Report for National Fishery Management Plans (WBS 1.1.1). Fish Exporting in the Grenadines Islands: Activities of Trading Vessels and Supplying Fishers. Training Report: Fisheries Early Warning and Emergency Response (FEWER). CRFM Technical & Advisory Document No. 2018 / 03. Draft Sub-Regional Management Plan for Blackfin Tuna Fisheries in the Eastern Caribbean (Stakeholder Working Document). CRFM Technical & Advisory Document 2013 / 17. On Friday, 22 February 2013, the Caribbean Regional Fisheries Mechanism (CRFM) will convene a meeting of seven Caribbean countries currently harvesting the Eastern Caribbean flyingfish (scientific name: Hirundichthys affinis), in Port of Spain, Trinidad and Tobago, to review governance and management issues that require immediate attention. Fisheries ministers who met on Friday, 22 February 2013, in Port of Spain, Trinidad and Tobago, to review urgent governance and management issues challenging the seven Caribbean countries that currently harvest the Eastern Caribbean flyingfish (scientific name: Hirundichthys affinis), are calling stakeholders across the region to action.